There’s a saying, ‘Music sounds better when it’s loud’. Well it’s true, but not in the way you may think. What you should notice is the 3.5kHz sine wave sounds louder than the 1kHz sine wave. However, they’re both the same reference level. This goes back to the point of humans not perceiving frequencies at the same volume level. The frequency we’re most sensitive to is the 3.5kHz tone. This is due to the ear resonating at that frequency. For example, if one was to blow into an ear like one would blow across a glass bottle top, it would give the frequency 3.5kHz. The range of frequencies we’re most sensitive to is 1kHz to 5kHz. It was this discovery that allowed telephones companies to save energy, broadcasting the most useful frequency range and, thereby, save money. It’s this frequency range that gives us the telephone effect. 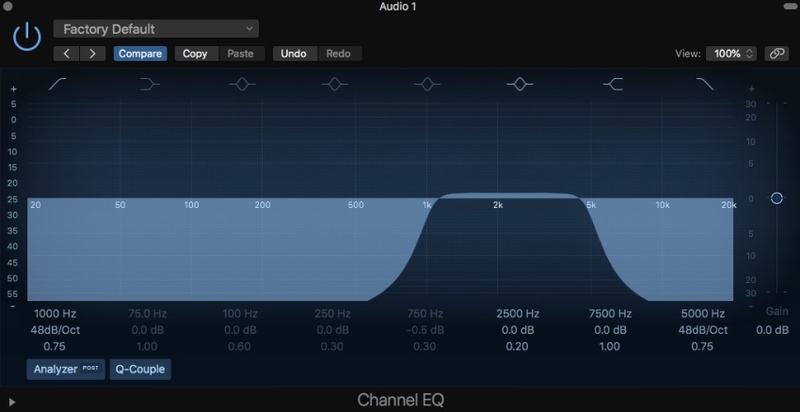 You can re-create the telephone effect by using a band-pass filter. If you don’t have the option of selecting a band-pass filter, you can create one yourself, such as the one below. It’s this equal balance of frequencies that results in a better listening experience. However, working at 90dB can cause fatigue as it’s considered to be quite loud, especially when 120dB is considered the threshold of pain. After all, there’s no point getting the perfect master that was created whilst working at 90dB, if it’s most likely going played at a lower volume level. Common sense is as important as theory.